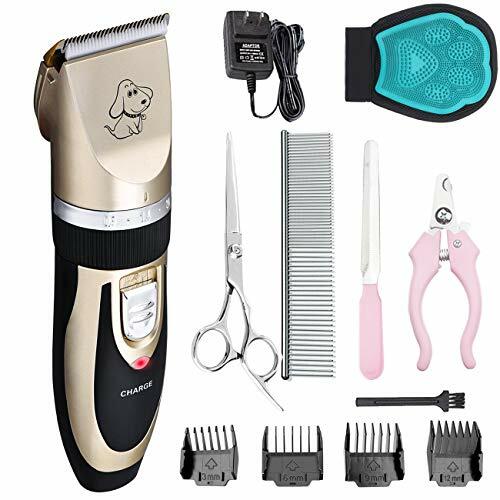 Giving your dog a blue ribbon look with the ENJOY PET hair clipper kit. With premium copper spindle and 15W motor power, the clippers have good wear resistance, fast heat dissipation, good sharpness and sound stability, which will not snag or pull. Durable and efficient for cutting through thick or curling hair. It helps get rid of unwanted hair and leaves your animal with a neat, groomed look. It will not hurt your pet no matter what angle with shaped edge design. And after testing, pinching the fast swing blade is not hurt the finger. Rechargeable dog trimmer with built-in battery is good for exceptional flexibility and maneuverability. And the clipper itself has 5 adjustable functions for the comb from 0.8mm to 2mm. High quality stainless steel fixed blade and ceramic moving blade provide excellent cutting performance. The blade sharp enough eventhough it after a long time using. Detachable blades for ease of changing and cleaning. Ultra-quiet Technology: 50-60 db. With Perfect blade adaption and Q-SUS silencer technology to reduce the friction between the blades, effectively reduces the noise. The adjustable clipping comb is applicable for clipping hair of different lengths; and the detachable guide combs make for quick, easy comb changes and increased versatility. With 4 attachment guide combs: thinning-out, (3mm/6mm/9mm/12mm,) skin-friendly contour-following combs make it safe, easy, comfortable. If you have any questions about this product by YUHEN, contact us by completing and submitting the form below. If you are looking for a specif part number, please include it with your message.